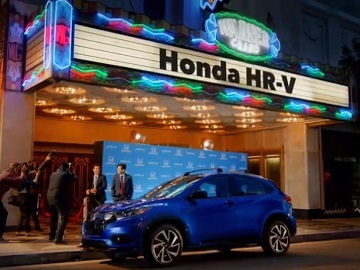 Honda showcases the sporty redesigned 2019 Honda HR-V in a new commercial, that encourages people to imagine what would happen if instead of asking why, they simply said “Why not?”. The 60-second ad features two co-workers in formal attire, stuck in a traffic jam, who notice a sticker on the car in front of them, the 2019 Honda HR-V Sport, that reads “Why Not?”. This is an impulse for them to say ‘Yes’ to a series of new experiences and challenges. Thus, they go surfing, fishing, to a goat yoga class, to a place where they can zip line indoor, to another place where they can skydive indoor, they go out for ice cream, they transport all kinds of things, from surfboards, a huge teddy bear, a huge inflatable duck, and more. “Amazing things happen when you say ‘Why not?’ the voiceover says at the end of the commercial, introducing the redesigned 2019 Honda HR-V, with Apple CarPlay integration for iPhone.